Amino acids from interstellar simulation experiments? Quite a few headlines enthusiastically proclaimed ‘Seeds of life are everywhere’ and ‘Scientists create life’s building blocks’. These resulted from two studies where scientists formed amino acids, the building blocks of proteins, by zapping impure ice, supposedly matching interstellar compositions, with ultraviolet radiation. This ice contained a fairly high amount of ammonia (NH3), methanol (CH3OH) and hydrogen cyanide (HCN). Both studies were published in Nature on 28 March 2002—one from a combined NASA/SETI institute study1 and another from Europe.2 But do the data really support chemical evolution (the idea that life evolved from non living chemicals)? What’s the truth about these experiments? Why are they looking at a space source? That is, Earth is regarded as a non-starter for chemical evolution. But because they already know, by faith, that chemical evolution is ‘a fact’, they look to outer space as a source of building blocks. It’s no accident that other evolutionists, such as Sir Francis Crick, the co-discoverer of the structure of DNA, and the late Sir Fred Hoyle, have resorted to such ideas, even going as far as panspermia, the idea that life itself began in outer space and seeded Earth.7 In Hoyle’s case, he resorted to this to overcome the probability problems, but he realized it was a vain attempt—see his obituary, and this section below. It’s also worth noting that the myth of the methane-ammonia primitive atmosphere is an ‘Icon of Evolution’, very hard for people to give up even though it was largely discredited in the early 1980s. But as shown, knowledgeable scientists like the European authors know better. 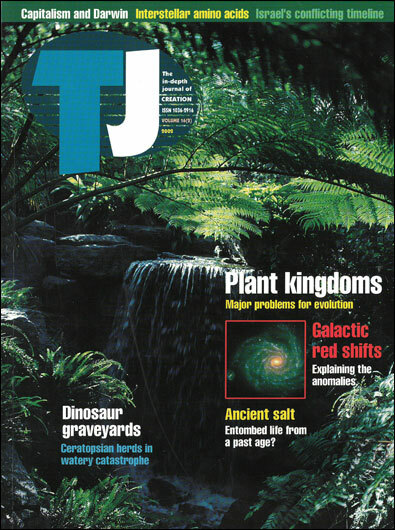 As a sidelight, Sir John Maddox, the then editor of the very journal Nature, gave a lecture tour of New Zealand in its sesquicentennial year 1990. Among other things, he claimed that the mystery of the naturalistic origin of life would be solved quite soon (I forget exactly when), and my then organic chemistry professor, a theistic chemical evolutionist and world expert on carbohydrate chemistry, repeated this in an origin of life lecture. His prediction must be getting close to being falsified, if it hasn’t been already. More recently Maddox has written What Remains to Be Discovered: Mapping the Secrets of the Universe, the Origins of Life, and the Future of the Human Race, admitting that the problem is still unsolved. Also, when I asked him about chemical evolution after his lecture in Wellington, he affirmed belief in the methane-ammonia atmosphere, despite papers in his own journal discrediting that. He still gives lectures on the origin of life, apparently advocating the RNA world theory despite major chemical problems. The amounts of these chemicals were tiny, with a quantum yield (Φ) of only 1.0 x 10–4, i.e. only one amino acid formed for every ten thousand photons, and 36% of that was the simplest, glycine.8 Only about 0.5% of the carbon in the methanol was turned into glycine.9 This is too low to have any hope of getting the polymerization10 needed for life11 — see Origin of Life: The Polymerization Problem. This is why peptides are never detected in either simulations or meteorites. See also Origin of Life: Instability of building blocks. So this can also be interpreted as evidence against chemical evolution, by showing that under quite optimistic laboratory simulations, only trace amounts of these compounds are formed. And even though they may be called ‘building blocks’ in the loosest sense of the word, they are incapable of actually building anything. The experiment produced 16 amino acids, but only 6 are protein constituents,8 and they comprise only 36.5% of the total (tiny) amount of amino acids produced.12 Also, these amino acids were only about 1/80 of the total amount of material formed—most of the material produced in simulation is typically an intractable tar. Of course, experiments that purport to demonstrate prebiotic amino acid polymerization, the linking up of many small molecules into one large one, never use anything like the dilute and ‘grossly contaminated gunks’13 produced by the typical experiments purporting to produce the amino acids. Living things require homochiral amino acids, i.e. with the same ‘handedness’—see Origin of Life: The Chirality Problem. But the ones produced in these experiments are definitely not. The NASA/SETI institute paper even has the word ‘racemic’ in the title, meaning an equal mixture of left- and right-handed amino acids. Some researchers have proposed that the simplest life form could exist with only 256 genes. This is most doubtful—see How Simple Can Life Be?. Mycoplasma is an obligate parasite because it needs more complex organisms to make chemicals it can’t make itself. Pathogenicity may be an indirect consequence of loss of genetic information, e.g. for amino acid synthesis—see Genome decay in the Mycoplasmas. So Mycoplasma may have descended from a more complex form by loss of information, meaning that the hypothetical first living cell would need more than 482 genes. Note that the idea that a single protein could function as a true replicator, promoted on some evolutionary websites, should thus be seen as the absurdity it is. I actually addressed the specific case they mention a few years ago in Self-replicating Peptides?, showing that this highly designed peptide has no relevance to the origin of life for a number of reasons. Once again, the pro-evolution newspaper headlines promote extravagant extrapolations arising from interpreting the actual data (even if reported accurately) in a materialistic framework. In interpreting the data in a Biblical creationist framework we stick to well-attested chemical principles. Then we see that the data provide yet more evidence against chemical evolution, since the naturalistic production stops at tiny amounts of impure and racemic amino acids. Bernstein. M.P., Dworkin, J.P., Sandford, S.A., Cooper, G.W. & Allamandola, L.J., Racemic amino acids from the ultraviolet photolysis of interstellar ice analogues, Nature416(6879):401–403, 28 March 2002. Return to text. Muñoz Caro, G.M., Meierhenrich, U.J., Schutte, W.A., Barbier, B., Arcones Segovia, A., Rosenbauer, H., Thiemann, W.H.-P., Brack, A. & Greenberg, J.M., Amino acids from ultraviolet irradiation of interstellar ice analogues, Nature416(6879):403–406, 28 March 2002. Return to text. Miller, S.L., A production of amino acids under primitive Earth conditions, Science117:528–529, 1953 [this made Stanley Miller world famous as a pioneer of chemical evolutionary research]. Return to text. In a previous issue of Nature (415(6874):833, 21 February 2002), information theorist and non-creationist skeptic of chemical evolution Hubert Yockey pointed out that Stanley Miller wasn’t the first. There were earlier experiments of Walther Löb (1913), Oskar Baudisch (1913), Edward Bailey (1922) and Harold Urey (1928,29). Yockey suggested that Miller merely augmented these previous experiments with modern separation and detection techniques such as two-dimensional paper chromatography. Coincidentally the significance of these techniques was emphasized by my organic chemistry professor. A reply by Jeffrey Bada and Antonia Lazcano Nature (416(6880):475, 6 April 2002) defended the significance of Miller’s experiments for chemical evolution, while Löb showed no interest in this. Return to text. Bar-Nun, A. & Chang, S., Photochemical reactions of water and carbon monoxide in Earth’s primitive atmosphere, Journal of Geophysical Research88:6662–6672, 1983. Return to text. Muñoz Caro et al., Ref. 2, p. 405. Return to text. The word ‘Panspermia’ comes from Greek words indicating ‘everywhere is seeded with life’. Return to text. Muñoz Caro et al., Ref. 2, p. 404. Return to text. Bernstein et al., Ref. 1, p. 402. Return to text. The joining together of multiple amino acids to form peptides. Return to text. Hull, D.E., Thermodynamics and Kinetics of Spontaneous Generation, Nature186:693–694, 1960. Return to text. Muñoz Caro et al., Ref. 2, (calculated from Table 1, p 405). Return to text. Cairns-Smith, A.G. has raised this and other objections against the typical ‘origin of life’ simulation experiments in his book Genetic Takeover and the Mineral Origins of Life, Cambridge University Press, New York, 1982. Instead, he proposes that life began as clay minerals, an idea completely lacking in experimental support but an example of the desperation of those who want to keep the faith but realise that the traditional scenarios are flawed. Return to text. Bada, J.L., Origins of homochirality, Nature374(6523):594–595, 13 April 1995. Return to text. Cronin, J.R. & Pizzarello, S., Enantiomeric excesses in meteoritic amino acids, Science275(5302):951–955, 14 February 1997. Return to text. Bada, J.L., Extraterrestrial handedness [comment on Cronin & Pizzarello, Ref. 15] Science275(5302):942–3, 14 February 1997. Return to text. Platts, S.N., On the apparently consistent L-biased enantiomeric excesses in meteoritic extracts as representing a form of attenuated forensic stereochemical evidence of chiral information derived from terrestrial contamination, Life in the Universe: From the Miller experiment to the search for life on other worlds — Seventh Conference on Chemical Evolution and the Origin of Life, 15–19 September 2003 (emphasis added). Return to text. Fraser, C.M. et al., The minimal gene complement of Mycoplasma genitalium, Science, 270(5235):397–403, 20 October 1995; perspective by Goffeau, A., Life with 482 Genes, same issue, pp.445–6. Return to text.